Colon cancer nearly killed Stephen Estrada when he was only 28. A quick-thinking doctor and experimental immunotherpy gave Estrada life, love and a new calling. The young men met and fell in love 10 years ago. Stephen Estrada, left, nearly died of colon cancer in his 20s. 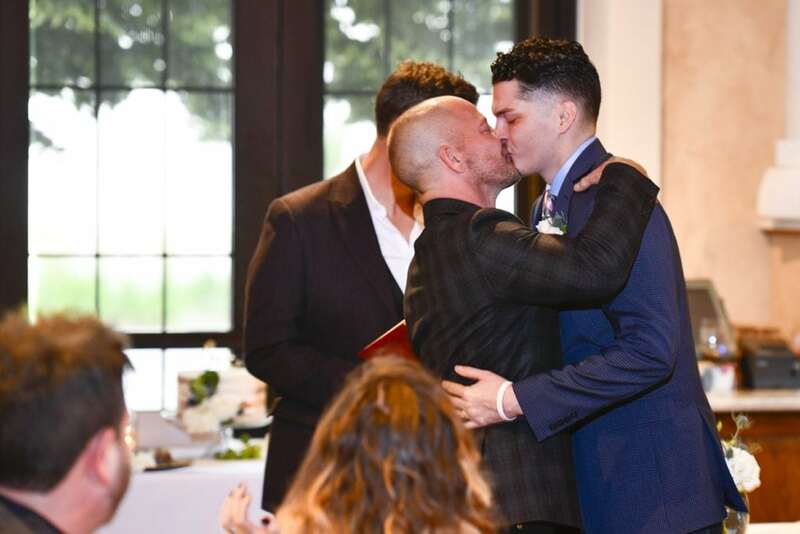 He recently married his longtime partner, Kenley Erskine, right. Photo by Cyrus McCrimmon for UCHealth Today. They hoped to marry four years ago. 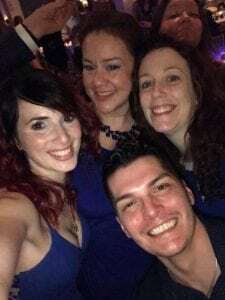 Then, Stephen Estrada was diagnosed at just 28 with colon cancer, a disease that usually strikes older adults, not young people who should have full lives ahead of them. Stephen Estrada dropped to just over 100 pounds as colon cancer ravaged his body. Photo courtesy of Stephen Estrada-Erskine. Estrada and his partner, Kenley Erskine, put their wedding plans on hold. “I didn’t want to get married and die,” Estrada said. For more than a year, he had suffered severe abdominal pain. He had tried to get help, visiting ERs multiple times, but each time he was told he probably had constipation, gas or some other gastrointestinal problem. He thought perhaps he had celiac disease. 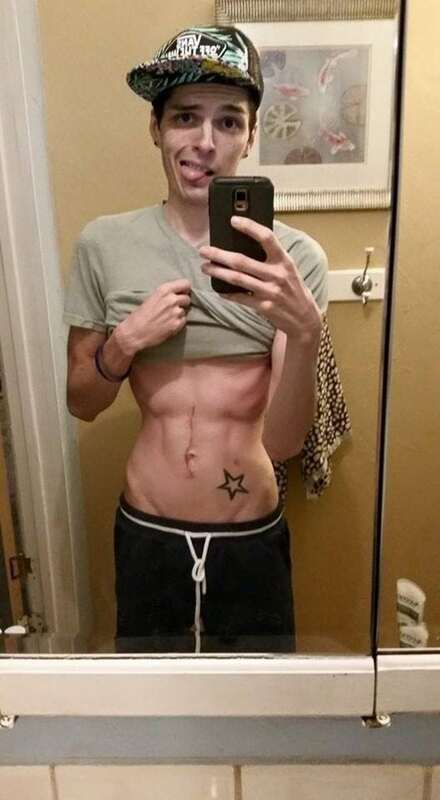 The handsome, fit hairdresser tried to eat healthfully and exercise more. But he was wasting away, growing sicker and sicker. Finally, he went to see his primary care provider, who discovered the cancer. It had already spread throughout his body and progressed to Stage IV. His outlook was bleak. Estrada sought treatments at a Denver cancer center. Doctors there did what they could. But there were complications. After one surgery, Estrada nearly bled to death. Eventually, doctors there told him there was nothing more they could do. His cancer was too far gone. Estrada shrunk from 175 pounds to just over 100. He looked like a prisoner at a concentration camp. Instead of marrying, Estrada thought he better find a hospice program. Then, through a series of coincidences, Estrada found a doctor at UCHealth University of Colorado Hospital, who only weeks earlier had heard about an experimental drug that just might save Estrada’s life. 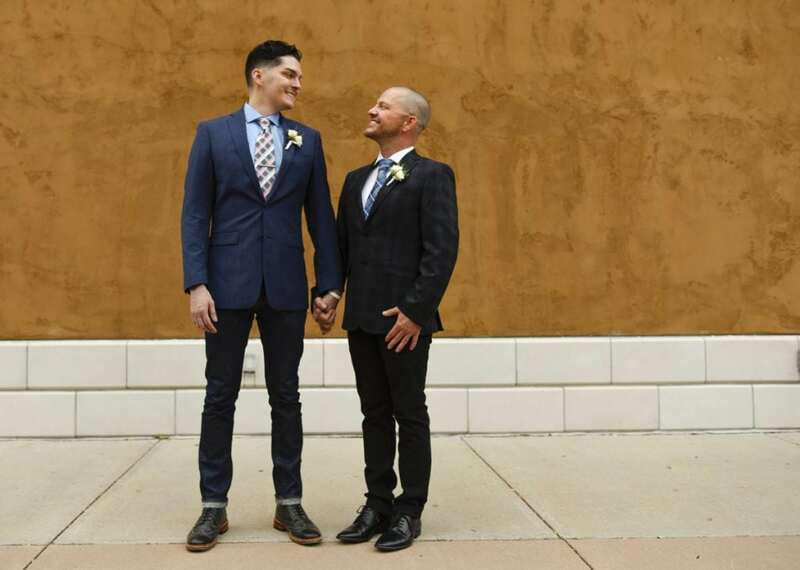 Following breakthrough immunotherapy treatments, on Aug. 1, the tenth anniversary of the day they started dating, Estrada and Erskine finally were able to get married. As they pledged their love to one another in a Denver restaurant, family and friends wept. They all had been certain they’d have to attend a funeral, not a wedding. “Here we are: the moment we’ve waited for, the moment we’ve talked about so many times. It’s taken forever,” said Erskine, 42. “I love you Stephen. You are my favorite person, my lover and friend. I vow to love and cherish you always. 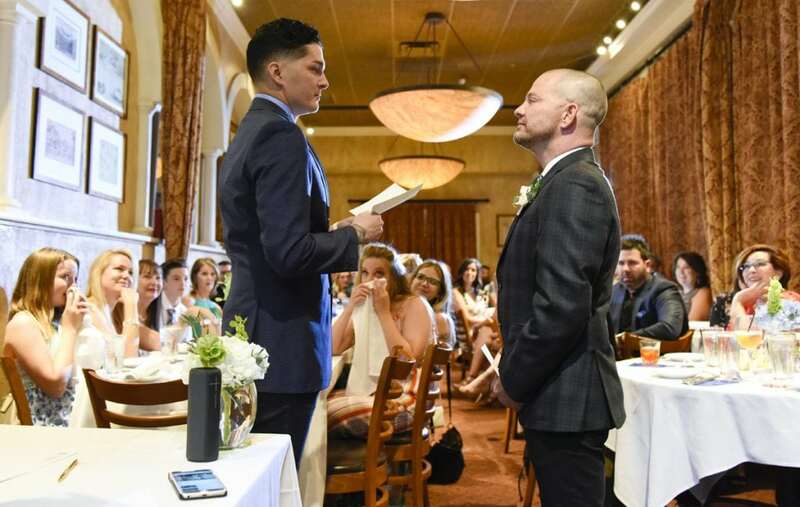 Stephen Estrada reads his vows to Kenley Erskine during their wedding as guests wipe away tears. Photo by Cyrus McCrimmon for UCHealth Today. “Thank you for what you do for others. Your persistence and dedication is inspiring to anyone who has been lucky enough to know you,” he said. Tears welled in Estrada’s eyes. He wiped them away. “Our lives have been full of laughter, friendship, love and heartache. You carried me through some of the most difficult moments of life. When I thought I couldn’t go on, you lent me your strength. When I thought I would leave this world, you carried me. And when the darkness seemed to be all around me, you helped guide me through it,” said Estrada, now 32. The grooms kiss after saying their vows. Photo by Cyrus McCrimmon for UCHealth Today. About 50 relatives, friends and co-workers at the salon where both men work cheered amid tears. The men exchanged rings, blended two carafes of wine into one to symbolize their union, then enjoyed a celebratory dinner. Life, indeed, had won out. But the journey to this very special day was a tough one. One of the lowest points for Estrada came after he thought he had run out of options. His grandmother, Suzanna Savage-Raftican, was visiting from California. Stephen Estrada received support from his long=term partner, Kenley Erskine during chemotherapy for colon cancer. Photo courtesy of Stephen Estrada-Erskine. Estrada slumped to the floor in the kitchen of the apartment he and Erskine shared. His grandmother curled up beside him and tried to offer comfort. The two shared a tough heritage. After his cancer diagnosis, Estrada learned that he had a genetic condition known as Lynch syndrome that put him at a much higher risk for getting colon cancer at a young age. It turned out that Savage-Raftican, now 70, also had it. She, too, had had colon cancer at a young age: 36. But back then, her doctors didn’t realize there was a genetic component. They happened to catch her cancer early. She had surgery and never had a relapse. When Estrada got sick, his grandmother never dreamed that her young and previously vibrant grandson would have the same disease that had sickened her decades earlier. Even though Estrada had been dealt a tough genetic hand, Savage-Raftican remained confident that he would survive. And it turned out she was right. 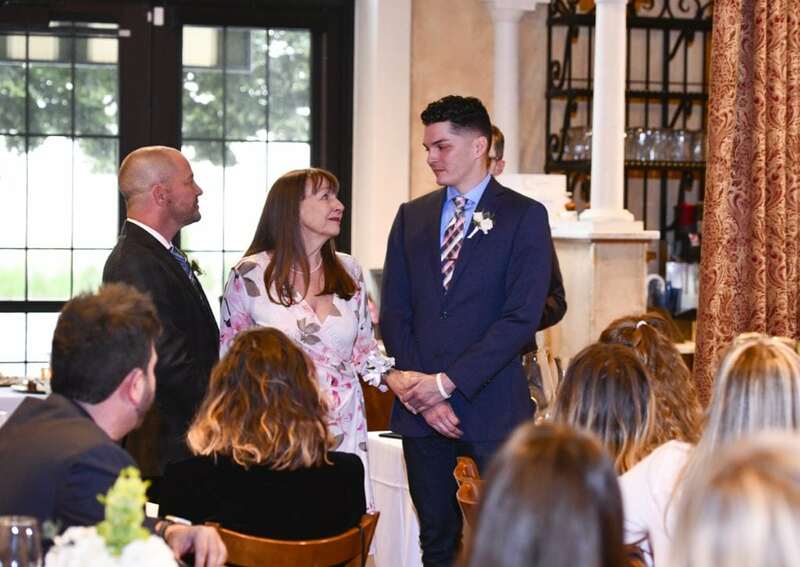 Stephen Estrada, right, with his grandmother, Suzanna Savage-Raftican and his husband, Kenley Erskine, on their wedding day. 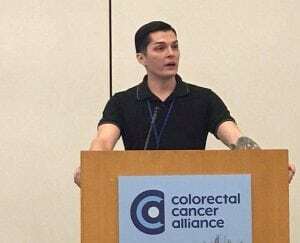 When Estrada got colon cancer in his 20s, the family learned they carry a gene that dramatically increases the risk of getting colon cancer at a young age. Photo by Cyrus McCrimmon for UCHealth Today. Soon after Estrada’s low point, he was feeling well enough to get out of the house one day and happened to hear a story about a famous actress who had cancer. A second opinion saved her life. A little later, he was back home and saw a second story online about a different actress and another lifesaving second opinion. Then he dropped his wallet and a doctor’s card fell out. At a support group about six months earlier, a fellow colon cancer survivor had given the card to Estrada. He had forgotten about it. On it was the name, Dr. Wells Messersmith. He’s a cancer specialist at the University of Colorado Cancer Center headquartered at the Anschutz Medical Campus. Estrada is more spiritual than religious, but he figured someone or some force of nature was trying to send him a not-so-subtle message: get a second opinion. And get it from Dr. Messersmith, who is also a professor at the University of Colorado School of Medicine and head of the CU Division of Oncology. Estrada picked up the phone and called. Within days, he was face-to-face with the man who would save his life. Messersmith wasn’t certain at first that he could help Estrada. But he became hopeful as he dug into his young patient’s medical history and honed in on the specific genetic defect that caused Estrada’s cancer. Remarkably Estrada called Messersmith for help at exactly the right time. “At academic medical centers, we tend to have the advantage of knowing about scientific breakthroughs a couple of years before they are reported,” Messersmith said. Estrada didn’t have a couple of years to wait. He needed a solution immediately. Messersmith told Estrada about the study findings and cautioned that he couldn’t guarantee any results. But, a sliver of hope was better than anything else Estrada was hearing. He was eager to be part of a clinical trial. Good fortune struck again. Messersmith couldn’t simply write a prescription for the immunotherapy drug that had worked at Hopkins because it hadn’t yet been approved by the Food and Drug Administration for Estrada’s type of cancer. But, because Messersmith was involved in some of the first immunotherapy trials in humans, he could get a similar drug and study how it worked in Estrada. He used one called atezolizumab. “It was a happy marriage of being aware of a breakthrough before it was reported and access to drugs that no one else had access to,” Messersmith said. Immunotherapy drugs don’t attack the cancer tumors per se. Rather, they help the patient’s own immune system detect and fight the cancer cells that are harming them. 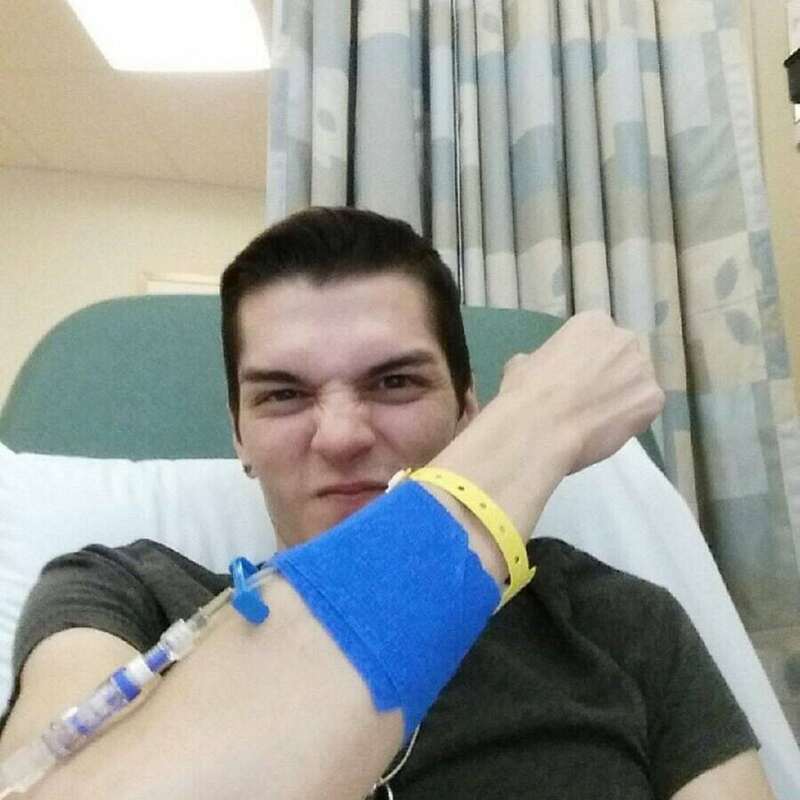 Stephen Estrada receives his first dose of an experimental immunotherapy drug. Photo courtesy of Stephen Estrada-Erskine. At first, the treatments were very painful for Estrada. It was as if he could feel his body hunting down and attacking the tumors. Good news came gradually. Estrada started looking healthier, feeling more energetic and slowly gaining weight. Scans later confirmed that the atezolizumab was working. Messersmith was thrilled to spare the couple and their families from heartbreak that had seemed inevitable. He credited Estrada and Erskine’s strong relationship for keeping Estrada going throughout his ordeal. “Stephen was really sick. He probably wouldn’t have made it (without the clinical trial),” Messersmith said. “He’s charismatic and kind. And Kenley has come to every single appointment. The support they have for each other is incredible,” Messersmith said. 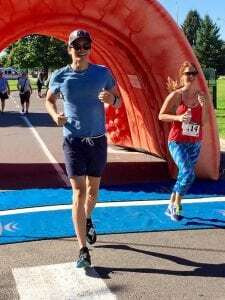 Stephen Estrada running in a 5K race to boost colon cancer awareness. Photo courtesy of Stephen Estrada-Erskine. Not only has Estrada benefited from the experimental medication himself. But, others like him should get access to new medications thanks to the lessons Messersmith is learning from Estrada’s treatment. Estrada also started working for the national nonprofit, Colorectal Cancer Alliance. He’s a certified patient and family support navigator, who helps moderate the Alliance’s private Facebook support group, Blue Hope Nation, that boasts more than 10,000 members. In particular, Estrada tries to help young people coping with colon cancer since so many support groups for the disease are full of people who are much older. “His advocacy work is huge. He has become exactly the person that he so desperately sought,” said Andrea Tucker, a long-time friend of both Erskine and Estrada and owner of the Denver salon where they work, Studio: A Collective of Stylists. Along with offering support to others with cancer, Estrada is fighting for more money for research. Later this month, he will be honored during the Cancer League of Colorado’s Race for Research in Denver’s Washington Park. Stephen Estrada-Erskine serves as an advocate for the national Colorectal Cancer Alliance. He has a second job working side by side in a hair salon with his husband, Kenley Erskine. Photo by Cyrus McCrimmon for UCHealth Today. While better screening through colonoscopies has reduced colon cancer among older adults in the U.S., the incidence of colon cancer among young people is on the rise. Among people ages 20 to 49, colorectal cancer rates have increased 51 percent since 1994, according to the National Cancer Institute. The American Cancer Society in May decreased the age at which adults of average risk for colon cancer should be screened. They now recommend screenings starting at age 45, down from age 50. 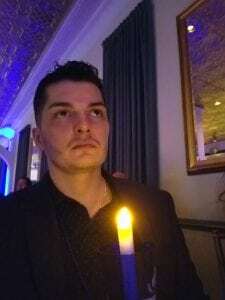 Stephen Estrada at a candlelight vigil in honor of patients lost to colon cancer. Photo courtesy of Stephen Estrada-Erskine. Messersmith said it’s unclear why the incidence of colon cancer is going up in young people. Colonoscopies are essential now for screening. But they are invasive and expensive. He said much more affordable blood tests should be available in future years that would lead to more targeted screening. For now, the new knowledge derived through research can save many other lives. After Estrada’s diagnosis, his mother was tested and she, too, was found to have colon cancer. Fortunately hers was found early and she has been successfully treated. Many others don’t know they’re at risk, Messersmith said. “It’s estimated that over 1 million Americans are walking around with these mutations and have no idea. Reaching out to families could save tons of people from getting inherited cancers. These patients could then be put into screening programs,” Messersmith said. He called Estrada a true pioneer. “We’re in this brave new world. There are multiple questions for which we don’t know the answers yet,” Messersmith said. 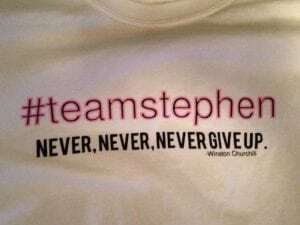 Stephen Estrada’s friends and family rallied around him as he fought colon cancer in his 20s. Photo courtesy of Stephen Estrada-Erskine. Estrada currently receives his immunotherapy infusions every three weeks during relatively painless 30-minute sessions. Thankfully, he’s not in pain any more. 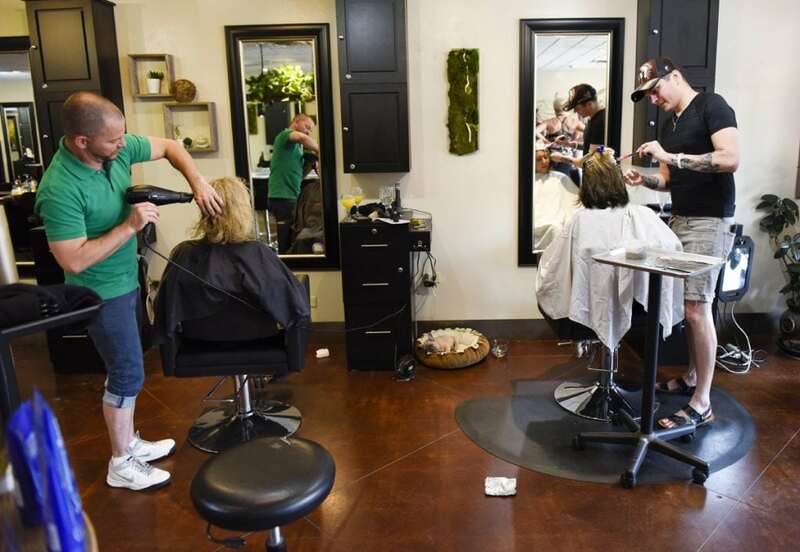 He just feels tired, so he takes his treatment days off from both his jobs: serving as an advocate and working as a hairdresser later in the day and on Saturdays at the salon in a booth next to Erskine’s. Messersmith said there have been some reports of patients who have stopped taking the immunotherapy and have done well. But, since Estrada is not having any negative side-effects, Messersmith doesn’t want to change his protocol for now. Among the greatest joys these days for Estrada and Erskine are simple pleasures like playing with their dogs or fixing up the home they bought 18 months ago. 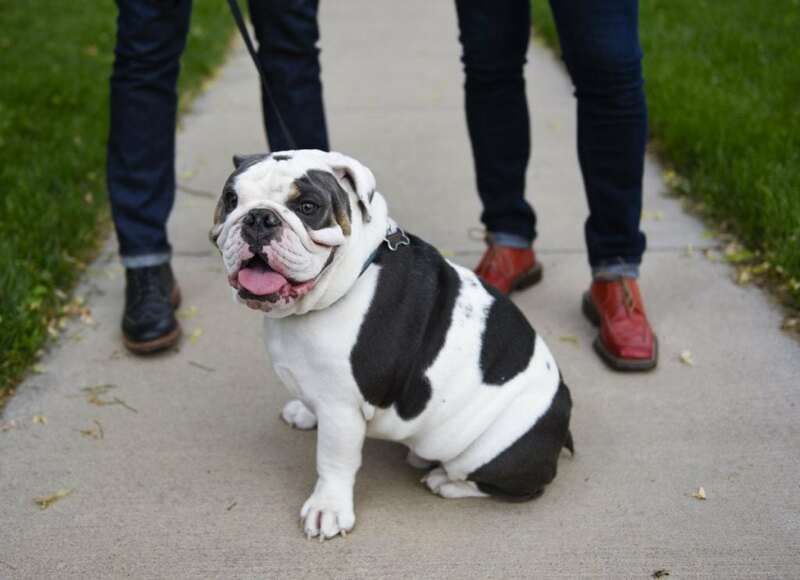 The men are proud papas to four dogs, including their newest, a puppy named Mr. Jimmy Chews. 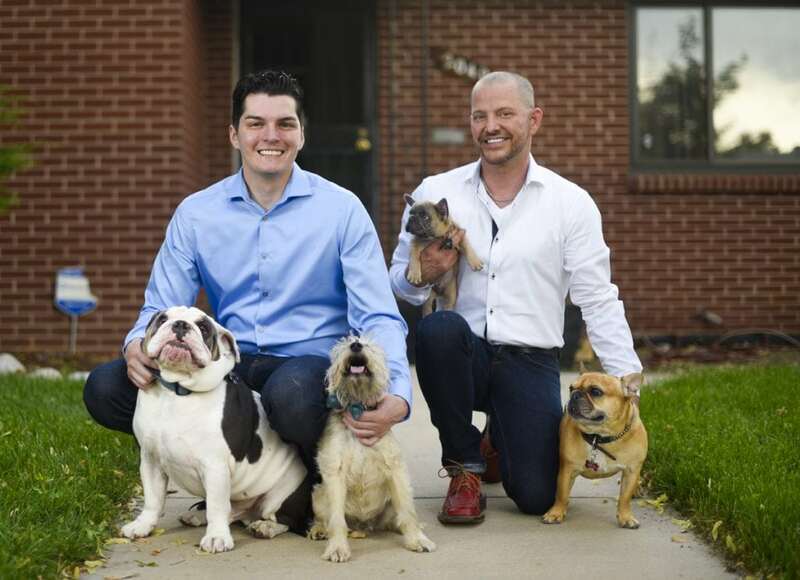 Kenley Erskine, left, and Stephen Estrada, right, with two of their dogs before their wedding on Aug. 1. Stephen holds the puppy, Jimmy-Chews. Kenley holds Gretel. Photo by Cyrus McCrimmon for UCHealth Today. Erskine said he never considered any other path. Stephen Estrada-Erskine now works as an advocate and patient guide for the national nonprofit, The Colorectal Cancer Alliance. Photo courtesy of Stephen Estrada-Erskine. “I dig in. It’s my nature,” Erskine said. He had an older brother who was sick with leukemia during much of Erskine’s childhood. Eventually, after 16 years, he healed. Enduring the illness taught Erskine patience and perseverance. “I think I was meant to be a caregiver for Stephen,” Erskine said. The two met when both were living in Dallas, then Erskine brought Estrada to Denver. Erskine believes everything that came next was fate. Unfortunately, Estrada’s genetic mutation meant that he was destined to get cancer. But when he needed a loyal partner, Erskine was there. And when he needed someone who could save him, the two were living in Denver, where they happened to find exactly the right doctor to help them. Stephen Estrada attends an event to support colon cancer awareness. 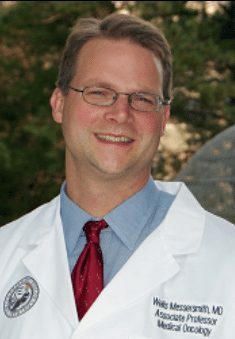 He now works for the national Colorectal Cancer Alliance. Photo courtesy of Stephen Estrada-Erskine. Estrada is convinced he has found his calling. He has met some who have not survived. He has vowed to keep fighting on their behalf. “We just lost a 17-year-old girl,” Estrada said. He will fight for people to be screened at younger ages. He will fight for people to get colonoscopies even if they are embarrassed or don’t want to be uncomfortable. And he will fight for other cancer patients to keep hunting for the right help until they find it. “No one should want to save your own life more than you,” Estrada said. After nearly dying from colon cancer, Stephen Estrada has been enjoying happy milestones in life. He and his longtime partner Kenley Erskine, have four dogs and recently bought a home together. From left to right the dogs are: Benny, Joey, Jimmy-Chews and Gretel. After years of postponing a wedding while fighting cancer, they were married on Aug. 1. Photo by Cyrus McCrimmon for UCHealth Today. And, each day, Estrada will be incredibly grateful for the man who’s been at his side in sickness and now, thankfully, in health. 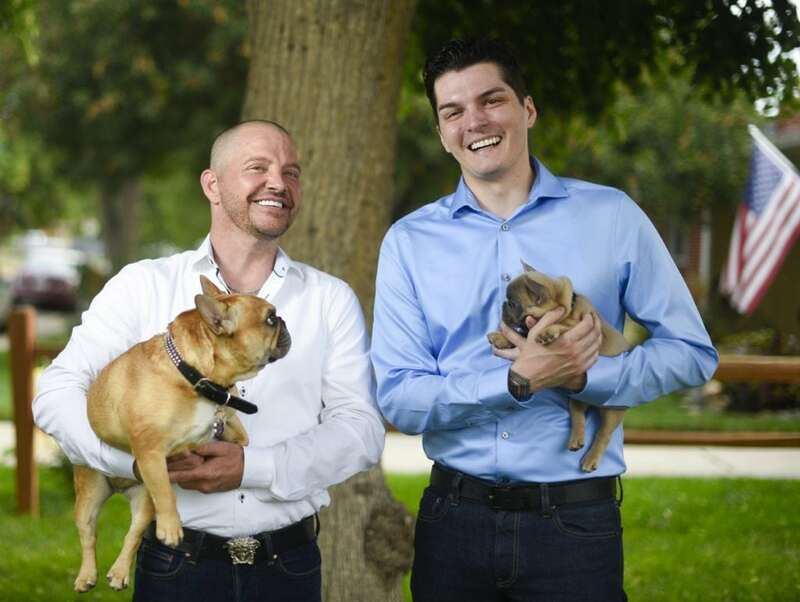 Stephen Estrada-Erskine and his husband, Kenley Erskine love spending time with their dogs. Here they pose with Benny. Photo by Cyrus McCrimmon for UCHealth Today. Then McDonald reintroduced the men.